By my mathematics, there are 57 players with shots left to play in round two and they'll be back on the course at 7am local time which is 13:00 BST for all you UK readers. So who does that suit? A momentum killer for Jason Day and Matt Jones at the top of the leaderboard? Those who have finished get a rest in the morning while their colleagues graft. How does this change your slant on things? You'll be back for more on Saturday I hope. We will be. Our live text will show up on the BBC Sport website during the afternoon and we need you lot with us because it's going to be frenetic. Thanks for your company today and goodnight. Is this a touch for those on the course? It seems play will resume at 13:00 BST on Saturday. That will probably take a couple of hours as all those still out there are past the turn and then round three will begin 30 minutes after round two ends. We will be in for a late one tomorrow. Earlier in this live text I mentioned the 199s film Twister and the fact a cow was hurled across a road by a hurricane in it. It was a gripping watch, but the point I was getting at was just how vicious weather can be in the US and how it can thrust itself upon areas so quickly. Here we see that in full action as the wind batters Whistling Straits suddenly and the thunder rolls in. Bunker down lads. Rory McIlroy and Jordan Spieth must be smiling back at their hotels. We have big breaking news... play is suspended for the day. Right then, if this rain is going to delay us it best be proper stuff and no drizzle. So, two Aussies lead on nine under - Jason Day (after 14) and Matt Jones (after 12). England's Justin Rose is one back after 17, with David Lingmerth of Swedena and Americans Harris English and Tony Finau on seven under. The projected cut is +2, which means Tiger Woods is probably toast - he's four over after 13 and staring a third successive major cut in the face. Bubba Watson, who lost a play-off at Whistling Straits in 2010, taps in for birdie at 16 to get back to -1. Kuchar misreads his par putt at the last and pops in for a round of 72 and four under par. South African pair and former major winners Louis Oosthuizen and Charl Schwartzel could be dark horses this weekend, they're both two under through 17 and hidden in the chasing pack. Rose makes birdie at 17, tucks in behind the leaders on eight under par. Day's birdie attempt just misses on 14, he remains nine under. Harris English moves to -7 with birdie at five, Russell Henley doubles the eighth and drops to six under. Rose pulls out a plum at 16, flopping out of the rough and tapping in for birdie to get to seven under. It has been brought to my attention that this is the first time Jordan Spieth has made the cut at the US PGA, although it is only his third appearance. Another one gone for Johnson at 14, he's now five under and four off the lead. Two three-putts in a row for Garcia, he stays one under after 16 and another dream appears to be fading. Brendan Steele in the clubhouse on six under, the American carded a second successive 69. Shot gone for Kuchar at 17, he drops to -5. Brian Gaffney is the first club pro to make the cut since 2011, he carded a second-round 73 and is level overall. We had a three-way tie for the lead on eight under after Russell Henley birdied seven, only for Jason Day to break ranks with a birdie at 13. A bogey for Dustin on the same hole sees him fall to -6. A smile and warm celebration and why not? Francesco Molinari has an awful stance on 11 so whacks one out of the rough onto the dancefloor where a roll or two later, the cup holds the ball. Some hole out. Eagle. Martin Kaymer needs to club up on the par-three 12th. He's on the green but 30 feet short of the pin. Tiger Woods is better placed, his strike sounded like a jet taking off, a birdie chance and Tiger needs to start making them. Rickie Fowler brings the prospect of missing the cut closer with a drive out right on 13 and he plays out from the thick stuff to leave an up and down needed for par. Jason Day, studies his line, visualises, delivers. Lots of spin on that high ball and around 12 feet for birdie. I just said these pesky eight footers are the putts champions make, so turn away now if you're a Justin Rose fan as he dribbles one away for par on 15. A mild show of anger from the Englishman as he talks to himself. "Two good swings there," he says as he rues bogey. Paul Casey's momentum is halted, though not by a full road block. A single bogey on 14 as he flunks an eight-foot putt. Those are the ones champions make. Dustin Johnson putts from the fringe of the green but a lack of pace leaves him only a tap-in par. Rickie Fowler has just seven feet for birdie... nope. Oh Rickie? When will you knit it together in a major? He's delicately poised on level par but one man who joins the lead is Jason Day. Bingo for him from five feet, the ball never deviated. A super tee shot sorted him out there, he'll dream about that strike later. So you've been warned, a weather warning. This is America after all. I'll never forget watching that film Twister as a kid where a hurricane threw a cow across the road. Things can change and severely with the elements here, though I'm confident no cattle will be involved today. You may be in for a late finish if there's a delay at worst. Jason Day sticks one 10 feet from the flag on the 12th to set up birdie on this par three. He watched it all the way, plonk on the green. Dustin Johnson gives his ball the glare now... 20 feet left for birdie. In seven attempts, Matt Jones has not finished in the top 25 of a major. The Australian, 35, has one PGA Tour win since turning professional in 2001 but leads the US PGA as Dustin Johnson makes a sloppy bogey on 11 - a par five where Jason Day makes birdie to reach seven under. A big slip from Dustin. Finau had a very good chance to get to seven under at the first but didn't hit his birdie putt. Brendan Steele makes eagle at 16 to get the six under. We have a weather warning, we might be going off for a storm in a minute... Matt Jones with a very rare thing, a birdie on 18, to join Dustin on eight under. Louis Oosthuizen has got it going a little, all pars and three birdies today. His latest comes on 12 as he tanks one off the tee to within six feet and drops the putt home. The diminutive South African you'll recall lost out in a play-off at The Open last month. His time? Rose with a good par save at 13, he stays six under. You can see the rain coming down yonder, it might be at Whistling Straits before long. Henley bogeys four, is six under after 13. Dustin Johnson finds himself in the lead despite only hitting the fairway three times from seven today. He's also only hit 44% of greens in regulation. It's a bit scrappy but there's nowhere better to be than out front leading. His biggest drive of the day is a mere 346 yards. Dustin to go first... perfect pace, perfect line, he grabs the outright lead on eight under. Kaymer makes birdie at nine to get to -4, Casey misses at 12 to remain -5. Day leaves his birdie attempt at 10 a couple of inches to the left, stays six under. Matt Jones has a chance to grab the outright lead but tugs his birdie putt left at 17. Casey looks very much in the groove, here he is with a very naughty tee shot at the par-three 12th. Day and Dustin both safely on in two at 10 after middling drives. Tony Finau out in 31, stays six under. Bit of weather expected at Whistling Straits, apparently, a storm brewing 12 miles north. Casey gets to within two shots of the lead after another birdie at 11. Sergio having a rattle with the short stick from miles off the front of the 13th green and that's gossamer touch. Jason Day at 10 and he finds the bunker, despite not going for the green. Actually, it came up short. Tiger dropped a shot at eight after thrashing about in the sand and rough, he's now four over. Four birdies and a double bogey out there for Willett today in a round of 70 to get him back to level for the tournament. Richie Ramsay of Scotland got to grips with this golf course a day late - he carded an 81 yesterday before a five-under 67 today left him four over and beyond the cut line. Bubba Watson, who lost out in a play-off at Whistling Straits in 2010, is level through 10, the much-fancied Louis Oosthuizen has picked up birdies at 11 and 12 to get to three under. Some of you may remember South Africa's Branden Grace from the US Open this year. He went to within a whisker of winning his first major. Woods can only stab his ball out of that bunker at eight, his round looks like it's going south again. Jason Day has left himself a long-range saver at nine after that errant approach and he's still got work to do. Johnson gets back into a tie of the lead with a birdie. England's Tyrrell Hatton drops a shot at six and is level par. Hatton, from Buckinghamshire, is 23 and is awaiting his first win on the European Tour, although he does have a few top-five finishes. He is named after former Olympic champion and world heavyweight contender Tyrell Biggs. One wants to believe. Only a par for Rose at 11, he stays six under. Day with his second at nine, from bang middle of the fairway. Deary me, he's found a pot bunker front left. Johnson has got 122 yards left after a monster tee shot and his second finishes eight feet from the flag. He dropped a shot at eight, by the way. Birdies at 10 and 11 for Spain's Sergio Garcia, he's now four under. Tiger Woods hasn't given up hope of making the cut but he's not having much luck out there - here he is muscling his ball out of some rough at eight only for his ball to skip through the green and nestle in a horrid little bunker. Eagle for Tony Finau at 16, he's six under and one off the lead. The 25-year-old from Salt Lake City is the first person of Tongan and Samoan ancestry to play on the PGA Tour. He is the cousin of Jabari Parker, who plays for the Milwaukee Bucks in the NFL. Brian Gaffney, head pro at Quaker Ridge in New York, looks like he might make the cut - a club pro hasn't done so since 2011. Gaffney has just hit the base of the flag with his approach at 14 and is level par. Better news for Victor Dubuisson today, the French Ryder Cupper carded 76 yesterday but he's back to level par after an outward 32. Jordan Spieth: "I feel good. I made a couple putts today. With a couple chip-ins for the week and really smart course management and good speed control, we have been able to hold ourselves in there." The world number two moved ominously into contention, at least as far as the rest of the field is concerned, with a 67 that leaves him on six under heading into day three. We now have a five-way lead on seven under, Russell Henley has birdied the first, his 10th. England's Lee Westwood was going great guns but a double at eight has seen him drop back to level. Better news for Justin Rose, who has just rolled in a birdie at 10 to get to six under and one off the lead. A third Englishman, Paul Casey, makes the most of a fine rough escape at nine to get to four under. Kuchar moves into that group one off the lead after a birdie at 11. Dustin going with three wood at eight and he's found sand, will have to play out sideways. Day finds the fairway. Yorkshire's Danny Willett will be around this weekend, he carded a 70 today and is level par overall. Matt Jones with a great long-range saver at 15, he stays seven under and tied for the lead. Birdie for Sergio Garcia at 10 after a delightful chip, he's three under par and in the reckoning. Dustin pops in for birdie at seven and we now have a four-way tie for the lead on seven under. Here's former champ Kaymer, very nearly making the green with his tee shot at six. The German is three under and very much in the mix. The projected cut has moved to +1, meaning Zach Johnson, Padraig Harrington and Shane Lowry (all +3) might as well phone a cab and get the hell out of Kohler. Here's Day on tee at the short seventh... bang middle of the green. Fowler made a good up and down for par at six to remain one under and he, too, is safely on at seven. Dustin going with four iron and he's gone right at the flag - beauty, should really be a birdie. Thanks Luke, this is Ben Dirs for a bit. Jason Day for birdie on six, he joins Lingmerth and Jones atop the leaderboard on seven under, great up and down from a bunker. Martin Kaymer goes flag hunting on the fifth as he arrows a wedge to within three feet of the pin on this par five. It's gorgeous, back spin, check, the works. In she goes with the putter. The drive the green attempts on six don't look like yielding birdie for Jason day or Dustin Johnson as they both fire bunker shots away from the pin. Big putts needed for birdie. Dig deep gents. John Daly is no stranger to ridiculously high scores on individual holes, as you might not be surprised to learn. At the 1998 Bay Hill Invitational, two-time major winner Daly carded a 13-over-par 18 on the par-five sixth. Daly needed seven tries to clear a lake with his third shot, having found the lake with his drive. "It was a comedy and a tragedy all in one," said playing partner Tom Watson. But there has been a higher score on the European Tour - Philippe Porquier carded a 20 at the 1978 French Open, his train-wreck taking place on the par-three 13th at La Baule Golf Course. "Spieth is like a chess player who just grinds you down, grinds you down until you make a mistake. "I think there are players with more talent but he's a once in a lifetime guy in terms of the mental strength he has." BBC Radio 5 live now where Iain Carter and Jay Townsend are dissecting the day's play. "It's a familiar story, with the man of the golfing year making his move." I love the sixth hole here - a par four which can be reached off the tee. It's always going to yield brilliance or chaos. It's like a bowling alley when the ball is on its way, what's the outcome? Feast or famine? 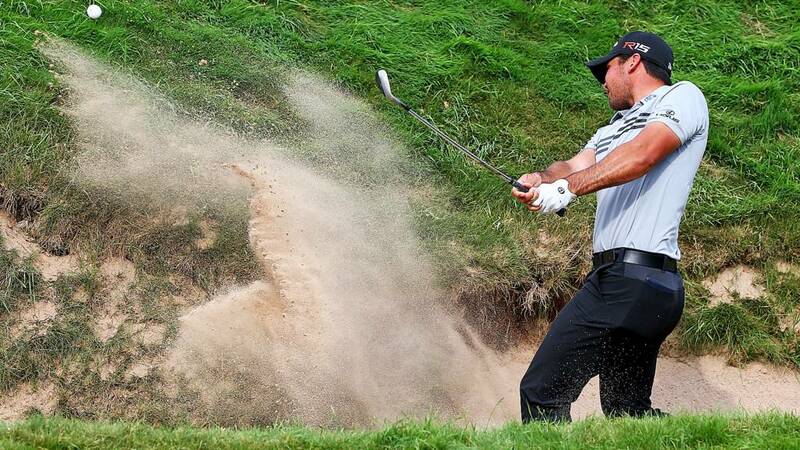 Here comes Jason Day first, short, bunker. Dustin Johnson, a smasher of the ball, same bunker. They won't mind that, an up and down for birdie is more than do-able. Both could earn a share of the lead. Co-leader David Lingmerth - on seven under - talks to Sky Sports after his round of two under: "I really had to fight today. The wind was easier than yesterday so there are some scores out there to be had. I was able to make a bunch of birdies but doubles and bogeys set me back so I had to fight to end under par." The par-five fifth looks like it has claimed Dustin Johnson as he hacks from rough into water. Wow, what a mess he's in here. He is hitting his fourth into the green now from range and sticks it 10 feet from the flag... converted for par. How in the world does he escape with par? Absolutely incredible. His playing partners Rickie Fowler and Jason Day are in for birdie. Johnson has struggled today but is right in there on six under. What do Jordan Spieth, Scott Piercy, Russel Henley, Harris English, Dustin Johnson and Matt Jones have in common? They're all six under, one back from David Lingmerth that's what. Hang on though, right on cue Jones wants to throw a spanner in the works as he taps in for birdie to join the leader. An Australian and a Swede lead the US PGA Championship. Justin Rose - is this the steamer in the field? Is this the moment he gets the surge they all want. Back-to-back birdies are sealed on seven after a majestic tee shot into the green. Another man looking hot, albeit with an awkward putting stroke, is American Tony Finau - he has three straight birdies on 11, 12 and 13 followed by a solid par but he has the front nine still to play due to his back-nine start. Plenty of big names already cut and on their way home, including: Northern Ireland's Ryder Cup skipper Darren Clarke (+15), Australia's former Masters champion Adam Scott (+7), England's Ian Poulter (+6) and Northern Ireland's former US Open champion Graeme McDowell (+5). Ireland's three-time major champion Padraig Harrington, his compatriot Shane Lowry, who won his maiden PGA title last week, and reigning Open champion Zach Johnson are all three over, one shot outside the projected cut and looking like they're dead. Players outside the projected cut who are still on the course include Welsh Ryder Cup hero Jamie Donaldson who is +9 after six. England's Justin Rose just misses out on an eagle at six but taps in to get to four under and three off the lead. Harris English buries a long-range birdie at 15 to get to six under and a six-way tie for second. Now sit back and digest this. After a couple of flirts with water on the 221-yard par-three seventh the American lashed his club into Lake Michigan. Hunting for a souvenir, a speed boat backed up to the shore allowing a youngster - in his swim shorts - to jump into the water, retrieve the club and wave it around like a trophy. His happiness a stark contrast to Daly's woe. Had Daly made par there, he'd be in line to make the cut. Now that's what you call blowing up. Tiger Woods has missed the cut twice in 17 appearances at the US PGA but is in determined mood not to make it three as he plonks one 10 feet from the flag off the tee on three. Anyone see the final day of the WGC Bridgestone Invitational last Sunday? Justin Rose putted like an elephant on rollerskates and he's not looking all that hot today. A missed birdie attempt on five. Hiroshi Iwata: "I have seen these kind of media centres on TV, but I'm honoured to be here to be interviewed. But when I came in, I thought that there was going to be more people, more media." The 34-year-old Japanese player gets used to being the centre of attention - at least some attention - after making the 27th round of 63 in major history. Sergio Garcia is quiet, just trundling along at his own pace, but birdies like this one will soon have his name up in lights. A beautiful read on the fifth green sees him down one from 25 feet. To Tiger Woods on two, six feet for birdie... bang... and Rickie Fowler on three... bingo. Three birdies, can any of them charge forward? If you're just joining us, Hiroshi Iwata is in the clubhouse after a 63. He became just the 27th man to achieve the mark in a major. Stay with us for some brilliant quotes from the performer of the day. The third really is a picture here as the tee box flanks Lake Michigan. The players tee off with the vast expanses of water to their left. This pin can be got at with the right length tee shot and Rickie Fowler is on point, setting up six feet for birdie, while Dustin Johnson and Jason Day leave longer efforts. Matt Kuchar - a smiley, nice type, - is feeling birdielicious on six to join a growing group of people tracking leader David Lingmerth. Jason Day - way left off the tee on two if you recall - has had a touch and set up birdie chance of around six feet. It's a trickler, no doubt about the line but will it dive in the front of the cup? It will. Given his drive that's a gigantic bonus. Pars for Dustin Johnson and Rickie Fowler on a hole where all three men did their best to make a pig's ear of proceedings. While you're revelling in the low scores at the top of the leaderboard, perhaps spare a thought for Ryan Kennedy. Kennedy, one of 20 club pros to qualify for this year's championship, carded a 90 today, 26 shots worse than Japan's Hiroshi Iwata. Kennedy, who coaches golf in Glendale, California, carded five bogeys, three doubles, a triple and a quadruple to finish +25. As I write, only two of those club pros are above the cut line, which will no doubt ignite the argument as to whether so many of them should be there in the first place. Hideki Matsuyama is a man much fuss is made about. Talk of a major champion one day, he does seem to have the credentials and a lovely left-to-right breaker on the seventh hole banks birdie. Justin Rose is about to taste the other side of golf - a double-bogey on four undoes his good work so far and takes him to level par on the day. They are all wayward, with the exception of Thomas Bjorn who holes out from the sand for birdie on the sixth. He raises his arms. Arms are raised as spectators duck for cover on two as Rickie Fowler and Jason Day go right and left respectively off the tee. Dustin Johnson sits pretty near the fairway but hooks his second. This is a par five remember - no need to be too greedy but he is and finds rough. That was a club-hacker shot. Justin Rose - a man known for being almost computer-like in the way he studies his game - sets his sights on a birdie on three from some range. It's a putt with lots of break but he's all over that and will it drop? Will it drop? Yes. The ball briefly brought out some double-sided sticky tape to cling to the lip but Rose blew it in. Birdie - five under. Stack 'em up lads. The groups are queuing on the second tee, it's just like your local municipal on a sunny day. I brought you news of Russell Henley's early surge a short while ago but given wears a visor I'm not sure whether to will him on any more. He finds trouble off the tee on four and after a hack, pitches to within eight feet for par. There's a list of players within touching distance of the lead now - eight players in all are within a stroke of David Lingmerth. They're stacked up on the tees and the leaderboard. Tiger Woods produced a delight from the bunker on one and leaves 20 feet for birdie. These are the putts he needs to shoot something extraordinary today and laugh in the faces of all us who doubt him. It's a nice stroke, he pushes the putter head through but it's slightly off line. Can Paul Casey go one better on the par-five second? He can. A routine putt of six feet is always a birdie. Rory McIlroy - currently two under - speaks to Sky Sports: "I definitely think that's one that got away. There are some good points in the round too and I'll try to take some heart from that and tomorrow score in the low to mid-60s. "The double bogey at 18 was a momentum killer. The par fives and the short par fours are where you're looking to take advantage of." What's the hardest part of returning from injury? "Being very efficient with your game, getting up and down when you miss greens, getting into scoring positions, that's the stuff that takes some getting used to. "If you had have given me these two scores in the middle of last week it's not a bad start but I feel the way I'm swinging it and feeling physically that I can kick it into top gear." Jason Day - always the bridesmaid never the bride at majors - has a putt for birdie on one and the chance to reach five under. It's only eight feet and he dribbles it past. Rickie Fowler has similar range... drops... birdie. What about Dustin Johnson? A long putt leaves a par tap in. Steady away. Tiger Woods off the tee on one... rough. He grimaces, almost looks sorry for himself. Remember the days when Tiger on the first tee lent itself to an excitement as you wondered what could happen? These days, sadly, we know what's likely. Can he find any form of groove again? Tweet us on #bbcgolf. Speaking of making cuts, Phil Mickelson does just that with a putt on nine - his final hole today - to end on plus one and guarantee his weekend place. It's only five feet and he nails it. Mickelson has been above and below par, yo-yoing all weekend. These Americans from left field are coming thick and fast to threaten the leaderboard. Russell Henley is the latest, firing two birdies in three holes to reach six under. The 26-year-old has missed the cut in both appearances at the US PGA but only a huge collapse would see him continue that pattern. Dustin Johnson - the biggest driver on the PGA Tour this year - takes the white club face on his driver and lampoons it through the back of the ball on one. Long up the fairway to join Jason Day's ball. Rickie Fowler's club has an orange face and he finds the smooth carpet too. Three of the biggest names in golf - Dustin Johnson, Jason Day and Rickie Fowler - are about to tee off. Not a major between them. Hard to believe. It's no birdie finish but Jordan Spieth makes par on his last hole of the day to end a superb round, he's not going to disappear this guy - the real deal. At six under, many in the field will feel his presence going into the weekend as he bids to become just the third man to win three majors in a year. Rory McIlroy will rue a double bogey early in his round but at two under is in the mix. Zach Johnson is done for. At three over, the cut has taken the Open Champion. "Simply didn't have enough of these today.!! Beautiful just chilling on the 13th tee sign," posts Ian Poulter. Poulter is heading home after a troubled two days. He misses the cut for the 10th time at a major. We have an outright leader. This guy ducks his head under the water, then pops out, back under, pops out - David Lingmerth is back in the groove as he drains a 25 footer for birdie on the hardest hole of the course. Job done for the day, put your feet up David. A haul of two under on Friday takes him to seven under overall and offers a one-stroke lead. Remember, if you're just joining us, Dustin Johnson is due out in the next 15 minutes - currently six under. Cheers Ben, let's start with The Open champion and his potential exit from this tournament after 36 holes. Zach Johnson is not well placed in the rough on the final hole of his day and at two over, knows he needs birdie to make what is currently the cut - one over. That's not to say that mark won't slip a little. "Get on it," his caddie says in a bid to focus his employer. Johnson is worried a tree in his line will hamper the path to the green so tries to play out, he's banking on a par here to stay at two over and hope the cut mark drops back. Risky. Jordan Spieth swings... "go hard, go hard," not for the first time his ball takes notice of the words as he sets up 15 feet for birdie, McIlroy has 20-25 feet for the same. England's Luke Donald in with a 70 for two under overall, Northern Ireland's Graeme McDowell will miss the cut after a second-round 75. McIlroy and Spieth safely away at the ninth, their final hole. I'm going to hand you over to Luke Reddy for a bit while I have some dinner. Greg 'The White Shark' Norman has not one but two 63s in majors to his name - 1996 at The Masters and 10 years earlier at The Open. I wonder what he has to say about Hiroshi Iwata's effort? We'll be monitoring social media where Norman tends to be fairly vocal. Spieth stays six under and tied for the lead after his birdie putt comes up short at eight, his penultimate hole. Zach's high-wire act continues, he might need a birdie at the last to make the cut after his birdie putt at eight stays right. McIlroy's birdie attempt squirts right off the blade, he stays -2. The dreaded 18th was just too tough to give up birdie and seal the first ever round of 62 in a major but Hiroshi Iwata makes par and sets a new course record at Whistling Straits - 63. His stunning round drags him back into contention for the tournament and perhaps sends a message to the late starters - this course is there to be shot at today. Any more Hiroshi's in the pack? Tommy Fleetwood is another Englishman on the first flight out of Whistling. Despite a level-par 72 today, he finished five over for the tournament. News reaches me that Iwata's second at 18 came up short of the green - unless he pitches in, we won't have a 62 today. Remember when Adam Scott started day one birdie-birdie. The Australian, a strapping fellow, has been using his anchored putter as always and to put it mildly, things have nose dived in terms of quality. At five over with two holes to go, Scott is going home for the weekend. Matching 75s for Ian Poulter, the Englishman won't be making the cut and his rather indifferent year continues. An indifferent year, I should add, that has earned him about a million quid. McIlroy can't make that par putt coming back and drops to -2. Zach Johnson rolls in his par putt to stay +2, Spieth remains -6 and tied for the lead. Hiroshi Iwata's back nine today: Par, eagle, birdie, birdie, par, birdie, birdie, birdie. Ireland's Shane Lowry is in with a 69 for +3 and it looks like he's going home. McIlroy has a very awkward stance at seven, but he stabs his ball out of the rough and to within eight feet of the hole. Europe's Ryder Cup captain Darren Clarke has added an 81 to his 78 and is also on his way. We make it 26 players to have shot a 63 in a major but as has been so regularly mentioned whenever someone gets close to this mark, no one has ever carded 62 in one of golf's four showpiece events. Hiroshi Iwata has two holes to find two birdies and make history - he starts well, sending his tee shot on 17 to within a yard. This is on. THIS IS ON! McIlroy makes birdie at six, is three under and four off leader Lingmerth. Zach missed his, stays in peril on two over. In goes Spieth, that's his sixth birdie of the day and he's now joint leader - Lingmerth has bogeyed 15. Zach has a birdie chance at six after a silky chip, as does Spieth after a nudge up the ridge. Rory, who was in the best position of all after his tee shot, fizzes his bump and run 10 feet by, although he's putting uphill. Stenson birdies six to get to eight under today and four under for the week, the Swede is a streaky old thing and needs one more birdie from his last three holes for the course record. Some of the late starters are converging on the practice area with Tiger Woods and Dustin Johnson - both wearing blue shirts today - putting and chipping respectively. Woods is off at 19:30 BST, Johnson 10 minutes earlier alongside Jason Day and J.B Holmes. McIlroy gives it some hammer off the tee at six and very nearly drives the green, his ball coming to rest in the hollow to the left. Zach leaves himself a wedge, as does Spieth, although the latter is in the rough. England's Danny Willett is one under for his round after 13 and +1 for the week. Phil Mickelson is one over for his round and also +1 for the week, both men right on the projected cut line. Spieth doesn't borrow enough for his birdie putt at five and stays -5. McIlroy borrows too much and remains -2. Plenty of scoring opportunities out there, despite all the pitfalls, Japan's Hiroshi Iwata is seven under through 15 and two under overall. American Kevin Chappell has carded a 68 for three under overall. We have a new leader - Sweden's David Lingmerth has made birdie the par-four 14th and is seven under, a shot clear of Dustin Johnson. South African Coetzee flew the green in trying to make birdie on 18. He clearly fancied a little piece of history but such reward is tough to grab hold of. All credit to Coetzee though, cracking shades and as things stand, he's 68 places up the leaderboard. Not a bad day's work. Shane Lowry of Ireland, who had his maiden PGA Tour win last week, might not be around this weekend. He's two over with two holes to play and could do with a birdie. George Coetzee finishes with a bogey at the devilish 18th for a round of 65 and the clubhouse lead on -5. Spieth laying up at the monster fifth and he very nearly finds the drink, but stays dry. McIlroy got lucky off the tee, his ball coming to rest in a network of bunkers but not actually in the sand. Nevertheless, he lays up as well. Stenson just made another birdie at the fifth, he's now seven under for the day and three under for the week. So, if things stay the same, who is going home and who is bang in trouble, with one foot on the private jet? Shane Lowry +2 through 15, Padraig Harrington +3 through 12, Ian Poulter +3 after 15 and Adam Scott, at five over with three holes to come, are all in trouble. The Open champion Zach Johnson also needs to find a shot at +2. Don't forget, Tiger Woods will resume at three over at 19:30 BST. Piercy lets shots go at eight and nine and is now four under. Lingmerth carries on with his rocking and rolling, he's birdied 12 and 13 to join Dustin and Coetzee atop the leaderboard on six under. Power off the tee key? Rory McIlroy is ripping the ball an average 318 yards of the tee today, that's longer than yesterday by some 14-15 yards so far. His power dwarfs that of Jordan Spieth, who has managed an average of 292 yards. Will the extra distance prove key or will Spieth's superb putting game keep him in there with the contenders? McIlroy with a cute chip back on from down the hill, he should make par from there... and does. Spieth also makes par, stays three clear of Rory on five under. Billy Horschel joins that group on five under and one off the lead, five birdies today through 11 and no bogeys. Stenson gets to two under, he's five under today after 13. And we have a new joint leader - George Coetzee has followed eagle at 16 with birdie at the par-three 17th to join Dustin Johnson on six under par. Par the last and he equals the course record. Spieth has got an awkward second shot at the fourth, ball above the feet in the light rough, but his ball just stays up to the left of the green. McIlroy is bang middle but his ball comes out of the oven somewhat hot and skips over the ridge at the back. Tough up and down from there. George Coetzee of South Africa is tearing the place up, he's just eagled 16 to get to seven under for the day and two under for the week. The world number 68 has won twice on the European Tour this year. Liang Wen-Chong holds the course record for the Straits Course with a 64 in the third round of the 2010 PGA Championship. PGA Tour golf writer Brian Wacker has been keeping an eye on the Spieths this week. Jordan will have just the par-three seventh today to have a go for an ace. Zach's birdie putt at three looks in but apparently isn't, because we can all still see it. The Open champion remains two over. Spieth didn't have anything like eight feet left, it was more like four, and he's now five under and one off the lead. Par for McIlroy, he remains two under. Oxford's Eddie Pepperell is making his PGA debut this week and after a first-round 78, he's two over for his first nine today and learning what life hanging with the big boys is really all about. Lingmerth's see-saw round continues, shot gone at 11, drops to four under. The final hole on the course - named 'Dyeabolical' - looks set to have a huge part to play in deciding who takes this tournament. The par-four hole, which even some of the game's big hitters struggle to reach in two, is a hole many of them probably hate. It has split Rory McIlroy and Jordan Spieth at the very least, with McIlroy three over for his two visits so far and Spieth one under. Roaringly hot on the shores of Lake Michigan and what a picture this par-four third is. McIlroy drawing his ball in off the tee and that's a peach, makeable birdie putt from there. Spieth with nine iron and if McIlroy's was a peach, Jordan's was a whole lot juicier, he's got an eight-footer for birdie. Zach Johnson also pretty decent, you'd give your eye teeth for any one of those tee shots. McIlroy eagle! Whatever Jordan Spieth can do, Rory can do as well, the world number one chipping in at the par-five second to get to two under. Spieth buries his three-footer for par and stays two off the lead. Before there was Jordan Spieth, there was a kid called Sean O'Hair. O'Hair was the PGA Tour Rookie of the Year in 2005 and earmarked for greatness but in never quite panned out that way, despite four PGA tour victories. But he's five under through 15 today and two under overall. Korea's YE Yang, champion in 2009, is one off the lead after steaming through his first 14 holes in three under. Lingmerth has nicked a shot back on 10 to get back to five under, South Africa's George Coetzee is five under after 14 holes and three under overall. Dustin Johnson looked poised and flawless throughout yesterday. His power fits the profile of this course and as the biggest driver on the PGA Tour this year - averaging 319 yards - does he have a clear advantage over the field? As we have seen though, there are doubts over his ability to close out a major and boy oh boy is there a line of players waiting to pounce on any mistakes. You are never far from trouble on this course, which is why you'll constantly see players drop without trace from the top of the leaderboard. England's Luke Donald is the latest to hit the skids - he was three under through five today before a double at 15 and bogeys at one and two. Sweden's world number nine Henrik Stenson is on a charge after a disappointing opening day, he's just gone out in 31 and is one under par. Stenson's compatriot David Lingmerth (pictured) did get to eight under this morning to lead by two, but the wheels have come off round the turn, courtesy of a double at seven and bogeys at eight and nine. Afternoon all. We join you at a crucial juncture on day two of the US PGA Championship, with Masters and US Open champion Jordan Spieth having just splashed in from a bunker at 18 to get to three under par, three off the lead. That lead, on six under, is held by American Scott Piercy, who has played six holes, and his compatriot Dustin Johnson, who tees off at 1920 BST.